Tourism New Zealand are continuing their Stories Beat Stuff campaign with a brand new competition for a lucky so-and-so to win the trip of a lifetime to New Zealand with three jammy mates. I first wrote about entering the competition earlier this year, but sadly my entry didn’t make an impact – I guess my time isn’t worth a $20k trip! Well this time the stakes are higher with a trip worth $30k. Understandably, I’m stepping things up a gear! As with last time, there are two different packages; Culture Kaboom and City Splendour. Culture Kaboom is catchily titled due to its focus New Zealand’s volcanic heritage. It’ll be an unforgettable experience packed with trips to hot mud pools and homage to Maori culture. If you want to have a go at entering the latest competition, it’s really simple. All you’ve got to do is submit a video or a photo of what you would trade for a trip to New Zealand – making sure it’s a real object and then share your entry round via Facebook/ Google+/ Twitter to get as many votes as possible. Obviously, it’d be lovely if you could vote for me too! To get involved, visit the Stories Beat Stuff Facebook Page. You don’t even have to trade to have a chance of make it to the other side of the world as a second prize of two flights to NZ will be awarded at random to one of the people who voted for the entries. It really couldn’t be easier. This is a sponsored post, but don’t worry – if I don’t like it, I won’t write about it! The words nearly flew out of my mouth as I stood at a bus stop in Finsbury Park on Saturday night. I’d had an uncharacteristic spat with a fellow passenger on a bus, forgotten my phone, broken a heel and got off of a bus, only to find out I was on the right route to my friend’s house after all. This was packed into an hour. A hour! Yet, that hour was just an example of eight days of pathetic activities and miserable occurrences. The previous Saturday I was getting ready for my ‘London-based birthday’ and decided to use a Lush shower scrub as a treat. I’ve used them before and have never had any problems, but when I got out of the shower I noticed I had big red scratches wherever I had used the product. Nightmare! After applications of sudocreme and a few days it had all but faded – no harm done, but depressing nonetheless. A few days later a signal failure on the Richmond Overground line meant needing to find an alternative route to work, via zones my travel card didn’t cover. It also meant that I was an hour later into work than usual. Luckily my manager was fine with it, but I still decided to get in touch with Overground customer service to see if they could help me. I was also resolved to sent an email to Lush and make sure that my experience with the scrub didn’t happen to anyone else. Although this week hasn’t got off to a flying start (I’m writing this with a mug of lemsip by my side) things looked up when I got pleasant replies from both the Overground and Lush. Lush, however, lived up to the friendly, personable customer service I’ve always found in the countless number of stores I’ve visited. 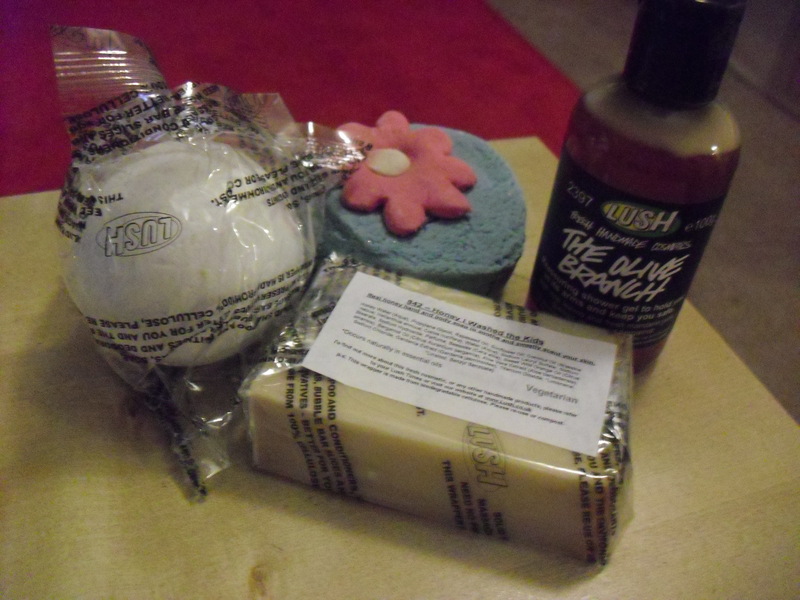 After we’d exchanged a couple of emails, Jamie from Lush Customer Care offered to send me a few products to make up for my experience with the sugar scrub. 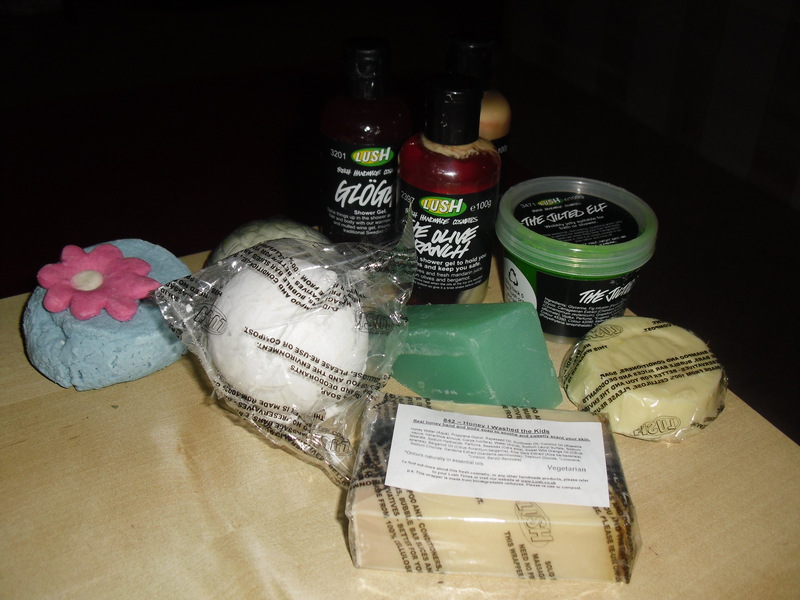 Of course, I happily accepted and yesterday picked up a box of lovely Lush goodies from the post office (see above!) Honey I Washed the Kids soap is my favourite Lush product – the first I bought and the present I bought for all of my friends when I was 14 for Christmas. It smells and feels divine. The goodies join my Christmas haul! My bathroom is already stocked with Lush stuff that I received for Christmas (see some of it in the picture above), and I hope to continue receiving and buying it. All of the packaging is recyclable, the provenance is respectable and the results, (bar that one aforementioned experience), brilliant. I also love the fact that I can pop into a Lush store and have a enthusiastic conversation about the products on sale or have one of the staff recommend me cosmetics that suit my tastes and needs. So tomorrow, when I’m scrubbing away in the shower (if the hot water decides to work), I shall try a bit of positive thinking and face the day with a smile on my face! In your opinion, who provides you with the best customer service?